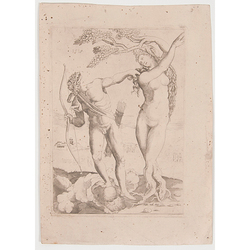 Bandinelli, Baccio; Engraving, (after), Apollo & Daphne, 9 inch. After Baccio Bandinelli, Apollo and Daphne, engraving marked Ant. Sal. exc. l.r., for Antonio Salamanca (Italian, 1500-1562), dated 1518 (date of original) within plate; image credit on full record.